I'm an uncle, yet again. I decided to create a page for my latest niece, my sister Rachael's first, born about a month after my father (z"l) passed away. I could beef this up quickly, but I'll do it the usual way. Every so often. Her mother--and her uncle--have lots to keep busy, but what would the Davidow family scapbook be without a page dedicated to this particular immediate branch of the family. As for my brother Moshe's family--it's time he got it together and did his own family scrapbook. He's every bit as web literate as I am :-). The first photo of Rahbie, at about four months, to make it across the ocean. 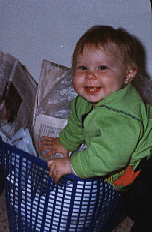 This is Rahbie at about nine months, demonstrating an early regard for recycling. Notes and photos from a trip down memory lane with my father (z"l), September 1995. Well it finally happened. On the 28 of April at 5:55 p.m. Rahbie Yisraela Davidow was born. Weighing in at 3 kg. 510 gr. That is about 7lb. 7oz. Both mother and daughter are doing fine. 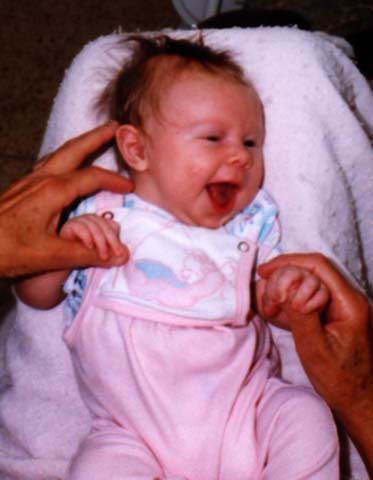 Rahbie was born with silvery light brown hair, new born baby blue eyes, And a sweet personality for a new born. The first minutes of her being in the world her eyes were open as she looked around before she succumbed to exhaustion. She is named after my father of Blessed Memory, Robert S. Davidow. We had thought about Roberta but felt it too heavy a name for such a sweet nature baby. So I went to my mother's nickname for my father which was Rob. Mom thought of ah! A beautiful baby. And I liked the ending ie instead of y. So Rahbie has come to life. Yisraela is the Hebrew name of my grandfather, Isadore Davidow. For those of you who know Hebrew the spelling is Resh, Bet, Yud. 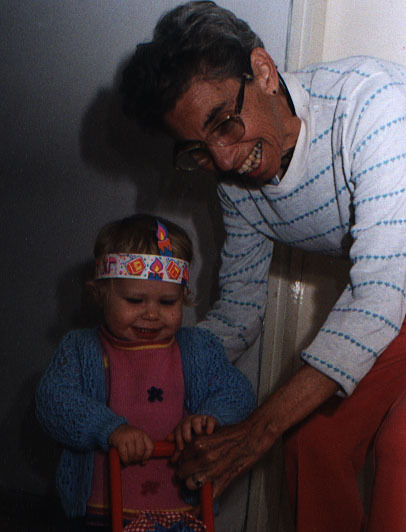 Today, the 23rd of January, 1999, I received a new packet of photos. 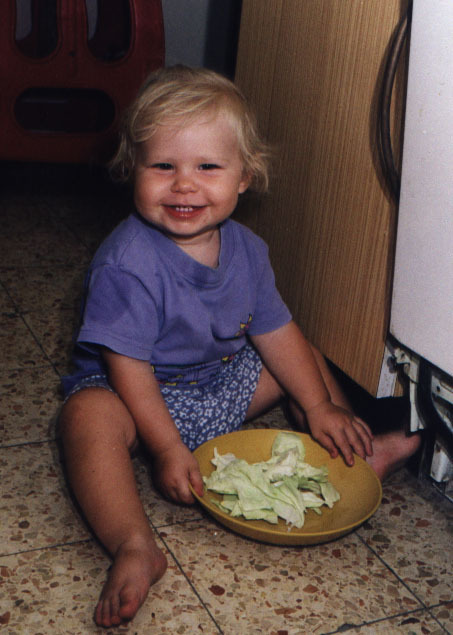 Among the new images, is this picture of her playing with a bowl of cabbage at "1 and a half years," and a picture which my sister has annotated: "Hannuka '98. Rahbie's new doll stroller. Notice the Hannuka crown. She bathed with it on as well as went to sleep with it." I like how much pleasure my mother takes playing with this latest granddaughter. January, 1999, is a sad month. My mother's brother, Marvin, passed at the very end of December of complications, I guess, of Alzheimers. We miss him very much, and all hope that we will leave as many good works behind as he managed. Marvin is survived by three sisters (including my mother), his wife, Jeanne, four children, and innumerable grandkids. 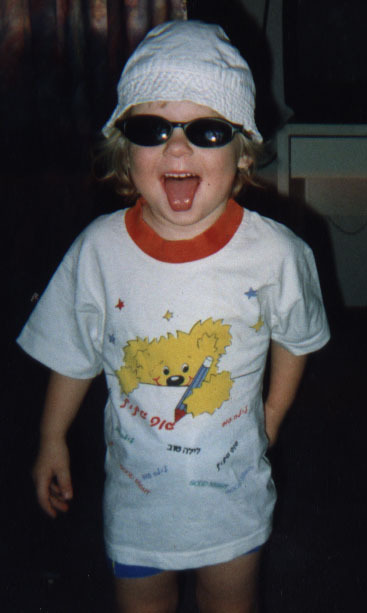 This picture is labeled, "Rahbie, June 2000, Shavuoth at Kibbutz Ramat Hashofet." 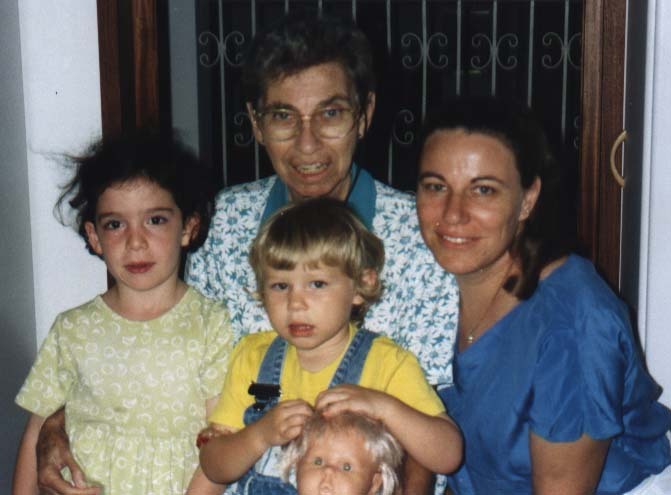 Here's a photo taken by my cousin Robin at Sukkoth, 5761 (fall 2000)Clockwise from Rahbie (who is in the center) is Bruria, Rahbie's friend and Robin's youngest daughter, my mother, and my sister, Rahbie's mother, Rachael. Thank you for visiting these Davidow Family pages. This page is maintained by Ari Davidow, ari@ivritype.com. Last modified Sat, 16 Dec, 2000.